The HRD Ministry(Government of India) is all set to go ahead with its plan to conduct a common engineering entrance examination from 2013, but the first nation-wide test may only cover technical institutions funded by the Central gov..
IIT-JEE and AIEEE — for long the gateways to India’s top engineering colleges including the IITs and NITs— is all set to be replaced by a comman entrance test to be called as ISEET - Indian Science Engineering Eligibility Test. The introduction of this test is expected to help do away with multiple entrance examinations and thereby reduce the stress levels of students. Duration of ISEET Paper-II-3 hours. 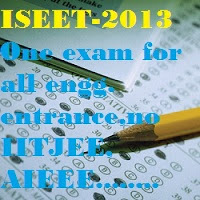 The two tests ISEET-I and ISEET-II together will indicate a candidate’s scholastic level and aptitude for science and engineering. A student’s score in the Class 12 Board exam will be considered, with the weightage not less than 40 per cent of the total score. The combined weight for ISEET-I and ISEET-II will not be more than 60 per cent; however, the weightage given to Board scores can go up to 100 per cent. Each state government or institute will be able to decide the specific weightage it gives to Board, ISEET-I and ISEET-IIexam/test scores. A committee headed by Dr T Ramasami, secretary in the Department of Science & Technology, has demonstrated with the help of the Indian Statistical Institute that school scores across various Boards can be normalized through a statistical process.